Well.. Well.. 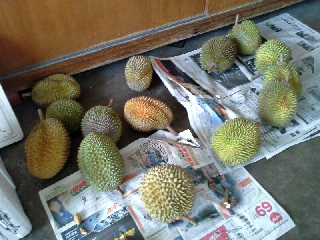 It is now consider durian season at Tanjung Sepat. How many of you know that Tanjung Sepat is not only famous for Bao but durian too? Tumbuk 'Penuh' durian is the most famous in the area (I dare to say in the nation) because I don't think you would be able to find any of them outside Tanjung Sepat area. The Tumbuk Penuh durian Orchard is located at 4km away from Tanjung Sepat Town (a place called Tumbuk) provided you are traveling from Sg Pelek direction. Mostly their durian stall is located outside of the Orchard. For some extra info on its name, Penuh Durian, I would like to present to you in brief on the naming as below. Orange Asli: Wah! Taukeh, Durian Penuh Ada kat sini ya. The Owner: Apa? Itu durian Penuh? Hi, I'm planning a trip to tanjung sepat and try this Durian there... can I have the contact number for this durian orchard? thanks! Hi, how do I contact you if I need some information from you? Thanks.